At WINTA’s Indigenous Tourism Forum held as the concluding day of the Adventure Travel World Summit 2012, my role was to explain why Indigenous Tourism is an approach whose time has most definitely come (slide deck here). When guests are received and hosted by indigenous peoples they have an opportunity to look at life through perceptual “lenses” that are not only different to the prevailing western worldview but are more likely to ensure our survival and prosperity as a species. It’s my belief that only when a critical mass of people become aware of the lenses through which they perceive the world (ie their unexamined assumptions, values and beliefs ) and wake up and become conscious will a real shift in collective human behaviour occur and we’ll start to live in harmony with Mother Earth. Travel and tourism can play its part in achieving this Shift. It was exciting to hear the Secretary General of the UNWTO position the 1 billion travellers as providing a huge opportunity to accelerate the shift in consciousness provided that the tourism community woke up themselves and assumed a role as guides along this adventurous journey! In order to achieve their core mission of empowering the indigenous people of the Amazon rainforest to preserve their lands and culture its leaders have understood that their success depends on the extent to which they can convince the western world of the relevance and power of a worldview that has sustained these first inhabitants for thousands of years. 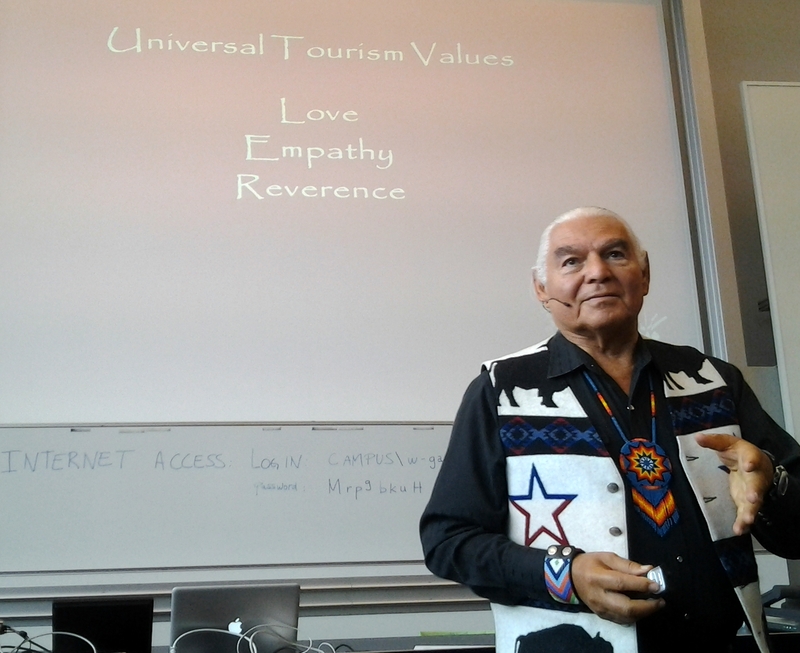 The article titled New Moon Action: Honor Time As a Sacred Gift expresses and affirms the values that Ben Sherman (from Lakota Territory in the USA) spoke so eloquently about at the WINTA Forum – values of love, respect, reciprocity, and gratitude. The Pachamama Alliance author points out that one of the most precious gifts of all is time – it is not a commodity that should be spent or even saved but a gift that should be consciously received (by stopping rushing and being still); shared (by focusing attention) and celebrated through acts of being rather than doing..
I’ll keep this article short because I know most of my readers consider themselves time pressed so rather than read my words please read the Pachamama post. When you start to think about time as a gift it puts the concepts of “voluntourism” and “slow travel” in a much deeper context with powerful implications for how tourism is practiced. As the indigenous worldview sees both time and space as a sacred gift, it’s less about spending time than investing time. People help each other using what has been described as “currencies of caring” i.e., “the mutual respect, relationships built on trust and the joy of sharing your gifts and talents” that Ben Sherman described as central to the indigenous world view. Every culture has a story of self and answers the question “who are you” “what does it mean to be human?” Our current story says that you are a separate being among other separate beings living in a universe that is separate from us as well. You are not me; that plant is not me; we are each something separate. This story of self creates our world. 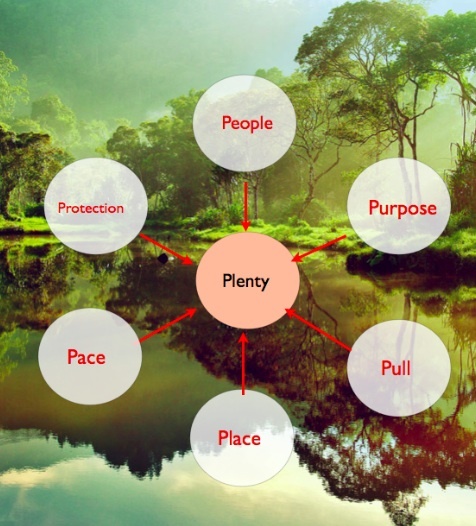 The values articulated in the Pachamama article form a key part of the Conscious Travel model as simplified in this expression of the 7 new Ps of tourism. Each guest experiences the gift of a unique place (space) at a unique time as seen through their own unique set of lenses. Conscious Hosts are encouraged and enabled to slow their guests down so that they can use all their senses to experience their surroundings (Pace). Even time can stretch when we are so immersed and captivated that we lose track of it and enter “the zone”, or “flow” and another state of consciousness. In other words, instead of needing to discount products as commodities, we have the opportunity to realize and release true value associated with enabling our guests to expand their consciousness through their travel experience. To quote the Mastercard advertisement – the travel experience that transforms- priceless. This is the essence of Conscious Travel.